Beside the primary science of Euclid, the wide survey covering 15,000 deg2 down to ABVIS=24.5 and ABYJH=24.0 will provide several billion galaxies and therefore additional cosmology probes for free, complementing weak lensing and galaxy clustering. Likewise, the Deep fields covering 40 deg2 down to ABVIS=26.5 and ABYJH=26.0 will provide several million sources that will be most unique samples for extragalactic and stellar astronomy. Both wide and deep surveys will be gold mines of targets for ALMA, JWST,E-ELT and TMT and will trigger synergy science with LSST, GAIA, e-ROSITA or SKA. 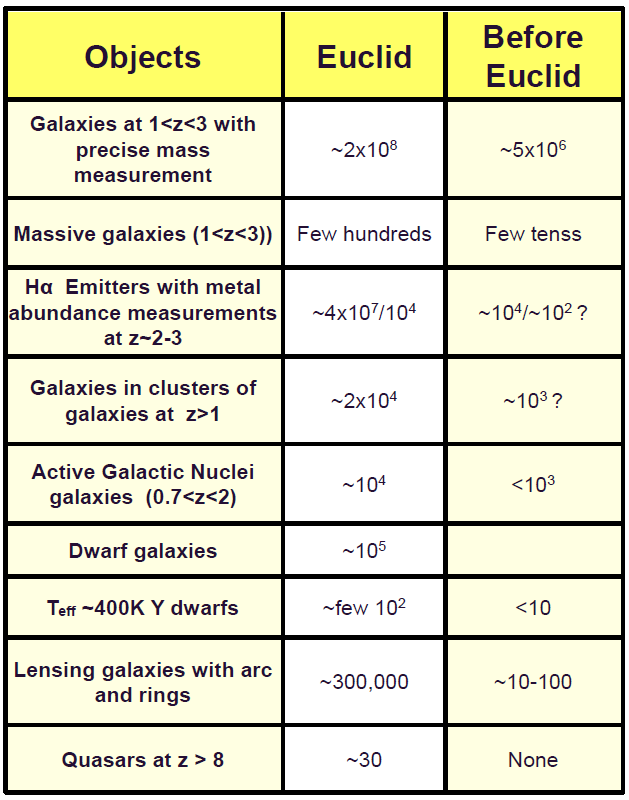 Examples of expected number of targets Euclid may find are listed in the table below. A table of source targets where Euclid may have major impact – Courtesy Euclid Consortium/Science Working Group.